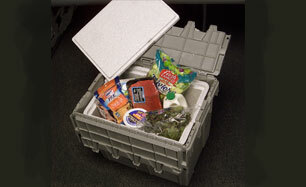 Our Tote Liners are the perfect fit for distribution containers whose contents need to be kept at a certain temperature. Used extensively in the food packaging and medical packaging industries, these tote liners provide the added protection some items need and can be reused numerous times along with the totes. Choose the tote liner that fits your shipping container from the table below. Please contact us if you require assistance finding the right shipping supplies to meet your needs. 7" ToteLiner Fits 20 x 12 x 7"Tote Base: 14.5 x 7Top: 15.5 x 8 x 4.5"h Base: 16.5 x 9Top: 17.5 x 10 x 6"h .75"
9" ToteLiner Fits 21 x 15 x 9"Tote Base: 15.5 x 10.25Top: 16.5 x 11.38 x 5.88"h Base: 18.13 x 13Top: 19.13 x 14 x 8"h 1.25"
12" ToteLiner Fits 21 x 15 x 12"Tote Base: 14.62 x 9.3Top: 15.94 x 10.63 x 8"h Base: 18 x 12.2Top: 19.44 x 13.63 x 11"h 1.5"
17" ToteLiner Fits 21 x 15 x 17"Tote Base: 15.5 x 10.25Top: 16.5 x 11.38 x 12.88"h Base: 18.13 x 13Top: 19.13 x 14 x 15.38"h 1.25"
SL ToteLiner Fits 28 x 20 x 12.5" Tote Base: 20.88 x 13.88Top: 21.63 x 14.75 x 10.5"h Base: 24 x 17.5Top: 25.75 x 18.75 x 13.81"h 2"